When we think of entertainment and something that can trigger the imagination, then the first thought comes up is of Television. TV has now become a part and parcel of our lives and we believe that it is a medium that prompts creativity, arises curiosity, encourages learning and unite all having common interests. It all started in the year 1959, when TV used to be a luxury, then in the 80s having a TV at home became a style statement. Now, we have multiple TVs in one house to serve our personal interests of all the family members in an effective manner. If we talk about the TV channels, then years ago it was only Doordarshan, but now there are almost 900 TV channels in India only. So, you can see on your own how tremendously the development has taken place in this field. The latest trend is (Direct-To-Home( DTH services, which provide you an opportunity to watch International TV series and Movies, latest News, Sports Update and everything from all over the world on your TV. The explosion that DTH services have brought in the last few years is unimaginable and now with affordable monthly DTH Recharge packages, everyone enjoys watching the number of channels on their TV. With cable TV the signals were not very consistent and the picture quality was also not that good. Due to the whole wired network, the signals tend to break and generally caused disruption in the picture quality. But, this issue has been resolved effectively with the establishment of DTH services. Having Digital signals and uninterrupted connection, DTH has now become favorite of all. 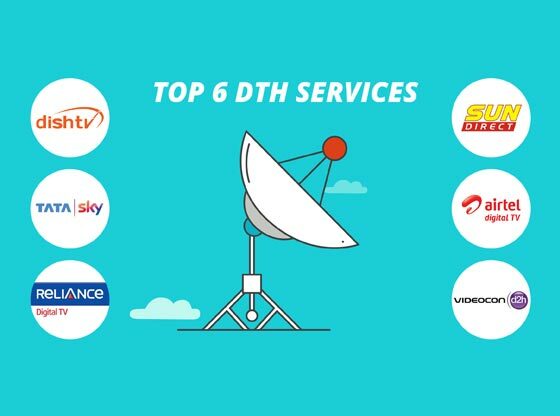 There are many more benefits of DTH like the mobility of connections, long-term subscriptions, easy installations, and affordability, which is accompanied by great DTH Recharge offers upgrades top-ups and more. Here, we have put together a list of DTH Recharge Services that will help you in choosing the best of all as per your needs and budget. Launched in the year 2008 by Bharti Airtel, it is one of the best choices for those who want to spruce up their TV with something that can actually complement the High Definition TV screens. Airtel Digital TV now offers about 400 channels and this is the reason why more than a million users are subscribed to it. It covers a wide range of categories of channels including Education, Lifestyle, Movies, Entertainment, Sports, Kids, News and more. Apart from the National and International channels, plenty of Regional languages channels are also there for those who love to stay connected with their culture. You can even record your programs with Airtel Digital TV and watch them later and you can also get multiple connections with a single dish. If you have more than one TV at your home and want to get Airtel Dish TV connection for all of them, then the multiple connection facilities are very useful with which you can also get some cool discounts and customized Airtel Digital TV Recharge packages. Dish TV is a venture of Zee TV, one of the most popular channels across India. Although it is one of the oldest, it has been upgraded over the years with the latest advancements. It is still leading the market due to the high quality that it maintains and the availability of a wide range of channels which attracts a large number of people. The cost of subscribing to Dish TV is still the lowest in the market and those who want to experience the best at the most economical rates can opt for Dish TV. Bachelors living away from home or people who want to save more can subscribe to this DTH service. It has features like Games, Interactive TV, Child Lock and comes with a huge number of Regional, Hindi and English channels. The combo packs and Dish TV Recharges are very inexpensive and can be done by availing different special deals and offers. It was launched in the year 2008 as one of the subsidiaries of Reliance Communications. Earlier it was named as Reliance Big TV, but later on, it was renamed as Reliance Digital TV. Their services are also offered in PAN India. The spectrum of channels that they cover includes categories like Music, Lifestyle, Sports, Entertainment, Movies, News and many more. And besides such an amazing collection of channels, they also have some extra features such as free internet games, pay per view movies, etc. They have updated their services as per the latest technologies and you will never get anything less than a premium viewing experience. The picture quality is crystal clear convoyed by an outstanding sound system and gives you a feeling like you are watching something in a theatre. The best part is that the Reliance Digital TV Recharges packages are very attractive and will allow you to get more for less money. Being the second player at the time of its launch in the year 2006, Tata Sky overtook the market quickly and gained the position amongst one of the top DTH brands in India today. It is a joint venture of Tata Group and 20th Century Fox. Earlier it started with usual channels and then when HD hit the market, they added a vast number of HD channels in their list. With the addition of the latest technology their customer base boosted and now it has become a frontrunner in the market. Tata Sky has embraced the latest technologies by launching the newest and the relevant products. And yes, how we can forget that Tata Sky was the first DTH service to live telecast the FIFA World Cup in the year 2014 in 4K UHD. It also provides special content like learning opportunities for the kids through channels related to cooking, dancing, music and more. The price of Tata Sky Recharges and packs are very competitive and will save your money for sure. An utterly amazing and wide assortment of different channels is the primary factor that makes Videocon D2H the best choice for all. The selection of Standard (SD) and High Definition (HD) channels is worth having when you can enjoy clear pictures and incredible sound quality with MPEG-4 technology. The Videocon D2H Recharge packages are very cost effective and with an add-on package, the entire family including kids, teenagers, adults, and seniors can enjoy their choices. On a long-term subscription, you will get huge discounts and that’s why Videocon D2H is good to go. This DTH service is basically available in entire South India and focuses majorly on the South Indian channels. Although the mainstream Hindi and English channels are available, a majority of the channels are South Indian. It was launched in the year 2007 by Sun network (Chennai based DTH service). You can definitely find a large number of Sun Direct DTH customers in South India, but in the country its presence is small. For amazing Sun Direct Recharge offers you can visit TalkCharge. We hope that now you can easily decide which DTH service you need to subscribe as per your needs and budget. The next important task is getting the DTH Recharge done on time and for that TalkCharge can help with online DTH Recharge services. With recharges, you will also get to relish BIG SAVINGS through offers and cashback. For more details visit www.talkcharge.com now. Boost Up Your Level Of Entertainment With Videocon D2H New Connection Offers!